It is required that each of your GL Accounts be assigned to one of these GL Types. Restaurant365′s out-of-the-box financial reports group your accounts by GL Type first, then by Parent Account, then by Account Number. 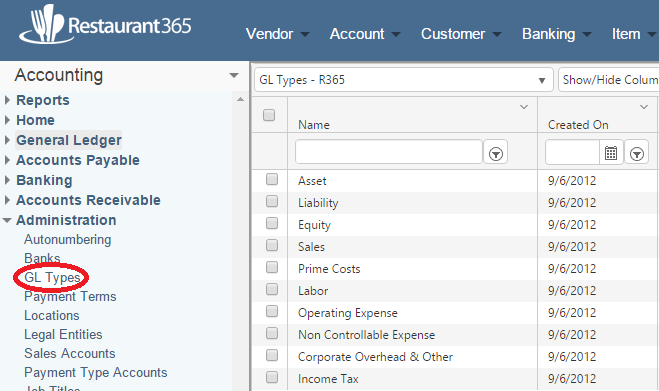 Restaurant365′s non-Profit & Loss reports (such as the Flash Report, Sales v. Labor Report) also leverage the GL Account attribute of GL Type when determining the value to display. On all the non-Profit & Loss reports, Restaurant365 labels the summation of all GL Accounts assigned to the GL Type of ‘Sales’ as “Net Sales”. The system assumes that you have assigned not only your revenue accounts to the GL Type of ‘Sales’ but that you have also assigned your Discounts & Comps account(s) to the GL Type of ‘Sales’ as well. Thus, on all the non-Profit & Loss reports, it is summing these together to display your Net Sales. The system uses this number to calculate other %’s and values. Although the wording in the non-Profit & Loss reports is hard coded to read ‘Net Sales’, there are many organizations that will want that number to be their actual Gross Sales. Those organizations should classify their Discount & Comps account(s) to the GL Type of something other than ‘Sales’. By doing so, the number displayed on non-Profit & Loss reports will actually be their Gross Sales even though it will still display as ‘Net Sales’ on the report. **It should be noted also that Restaurant365 security uses GL Type to restrict manager’s view of the Profit & Loss reports to only controllable dollars by using the GL Type. For example, when a user assigned to a ‘Manager Role’ runs the Profit and Loss report for his store, he only sees data for GL Accounts assigned to the GL Type of Sales, Prime Costs, & Operating Expense. All other accounts are restricted.